According to Scarborough Research, Internet coupons now account for 11 percent of all coupons used in the United States. That's a number that will only continue to grow as businesses and consumers become more web-savvy. We've written many times before about the importance of creating a coupon for your MerchantCircle listing because of the SEO opportunity, not to mention the free cost, compared with print. Internet coupons have several advantages compared with traditional coupons. Many online coupon services use templates that business owners can fill out, allowing them to quickly and easily create custom deals. And because the Internet is always open, business owners and consumers always have access. "It's so much easier when you can fill it out right then and there," Greenway said. "The availability of them being out there 24/7/365, generally for free, is a great form of advertising." Electronic coupons aren't limited to individual business' Web sites. 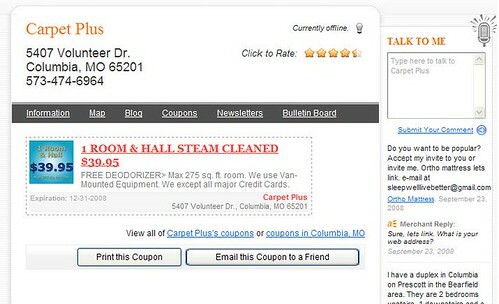 City governments, chambers of commerce and even Google have jumped into the online coupon game. Justin Christmas, owner of Carpet Plus, posted his business on MerchantCircle about six months ago. He said he sees one or two people a month using coupons printed from the Internet. Mirra Greenway, of Greenway Massage Team, in the article says, "It seems to be increasing (Internet coupon usage). There's not that much out there yet, but the sooner you get in on something, the more traction you get." Words well spoken. Don't forget to create your coupon on your MerchantCircle listing using our free tools found here.